Dangal had opened across 5,300 screens across India, Thugs of Hindostan opened across 7,000 screens. Aamir Khan, who has had a great run in the box office in the recent couple of years, has come up with a multi-starrer this Diwali. Thugs of Hindostan, an action-adventure film produced by Yash Raj Films, will naturally be pitted against Dangal - Khan's previous blockbuster. Dangal, India's highest-grossing movie made more than Rs 2,000 crore in the box office, with most of it coming from China. However, if reports are to be believed, Thugs of Hindostan's opening day saw better business than Dangal's opening day. 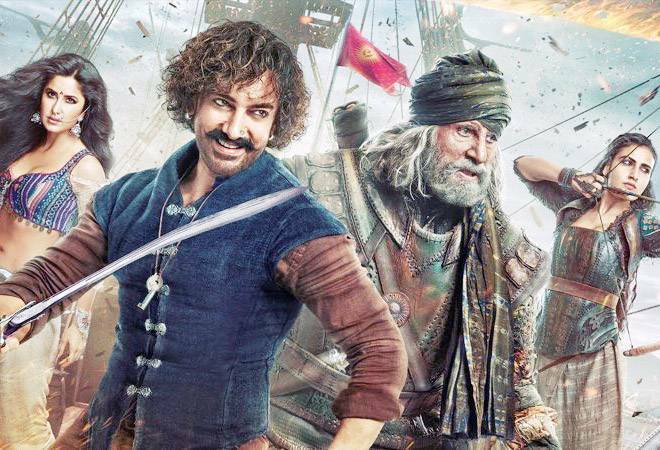 According to a report in India Today, Thugs of Hindostan's opening day collection stood at Rs 40 crore, whereas Dangal had made Rs 29.78 crore on Day 1. It must be mentioned that while Dangal had opened across 5,300 screens across India, Thugs of Hindostan opened across 7,000 screens. During an interview on Karan Johar's show, Aamir Khan had said, "I am especially nervous about this film for one reason that people are used to seeing my films with some message in it or some new concept. This is a film, which is really a mainstream kind of a film. So I am hoping that people will not get disappointed. I enjoyed doing the film, I hope the audience enjoys it as much." However, reviews for Thugs of Hindostan have largely been negative. Many critics have called the film a snooze-fest and boring. The portrayal of female characters have also been criticised as well as the VFX that has been so generously used in the film. India Today gave Thugs of Hindostan one and half star in its review and said that "Thugs of Hindostan sways between being a Game of Thrones rip-off and an animated version of Pirates of the Caribbean". While the movie has an A-lister star cast with Amitach Bachchan and Katrina Kaif along with Aamir Khan, critics are of opinion that little can be salvaged. Thugs of Hindostan stars Fatima Sana Shaikh, Mohammed Zeeshan Ayyub and Ronit Roy as well. While the next big release is the upcoming Rajinikanth-Akshay Kumar-starrer 2.0, which is three weeks away, Thugs of Hindostan's long, uninterrupted run could be marred by bad reviews and negative word-of-mouth. On the other hand, it is an Aamir Khan movie - he has proved time and again to be the undisputed king of box office. Additionally, after Dangal, moviegoers have been impatiently waiting for Aamir Khan's next big release. It still remains to be seen if Thugs of Hindostan can give some competition to the much-loved Dangal.